New items are added on a daily basis, so come back often! All feathers are high quality and ready to be used for jewelry making, decor, accessories, hair extensions, millinery, craft projects, fishing and much more. Our discount system is based on volume purchase of the identical feather types (not mixed order of various feather types). Stated differently, savings are realized when you buy more of the same type of feathers or other items. Discounted prices are reflected in the WHOLESALE / BULK FEATHER section and/or the “Number of feathers” variation of the listing. Volume discounts vary depending on the feather and generally start at the minimum order of 10”-12” inches for strung feathers and 60 pcs for loose feathers. 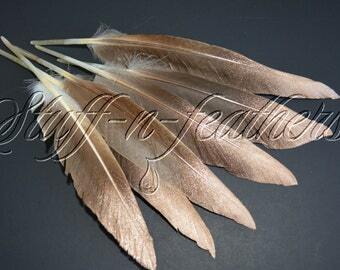 If you do not see the feathers that you are interested in in the wholesale section, please contact us for a quote. 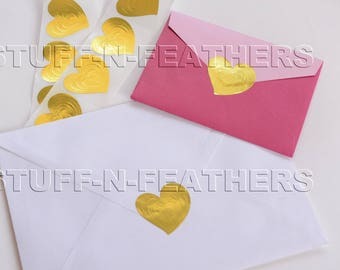 New SMALL version of our embossed foil sticker seals is now available in both Gold and Silver! 2 color set - Light Blue and Gray - small curled Goose coquille feathers. Also available in White and Lavender. This is the perfect way to try out new colors for your creations! 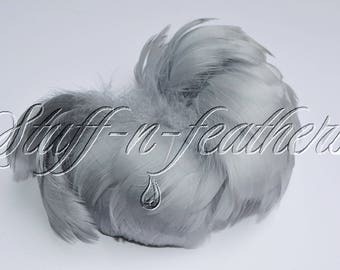 Introducing Limited addition feather assortment natural rooster variety - saddles, hackles and schlappen. More assortments to come! Our embossed foil seals look as good an the envelope as on the gift packaging! Add a small feather for a unique look. Electroplated sea shells have variety of uses - from jewelry making to cake decorations. What is your unique idea? Our silky smooth feathers are a TOP Quality - they are clean, steamed, prepped and ready to be used. Our top quality feathers and decorative mosaic tape are the perfect choice for wedding and special event decor. Thank you for visiting Stuff-n-feathers! We offer a selection of natural and died feathers, craft and decorative supplies as well as our unique creation exclusive hand painted collection of feathers. All of our feathers go through a strict quality control. All feathers are natural and /or dyed to achieve vibrant colors and as such the color pattern and shape may vary. Each and every feather is stored, and handled to ensure the highest quality of care. All feathers are clean and ready to be used. In order to keep feathers healthy and sanitary they have to be protected from moths and other pests. Feathers are aired out before they are sold, however in rare occasions the scent of “moth balls” lingers. In order for the scent to go away they need to be taking out of the packaging and placed in a well-ventilated area, preferably by the open window or outside, for a few days. This will also help feathers to “open up”, as they may get compressed during shipping. Feathers that are sold loose are handpicked. Hand painted feathers are handpicked and individually painted to order. When buying strung feathers, is it normal to expect some feathers in the bunch to be imperfect. Strung feathers are densely packed together and connected with a thread or a small cord, but they can be easily separated into individual feathers. When you compare different feathers keep in mind that strung feathers have MUCH greater amount of feathers per inch than a trim or fringe. Feather length is measured from tip to tip, for strung feathers - from tip to tip when the feathers are strung. Feathers in the package you will receive can be anywhere in the described range. They will vary from order to order depending on the length in stock. We strongly suggest reading the description of the items before purchasing. You can contact us via Etsy messaging system with any questions. We want all our customers to have a pleasant shopping experience and to be happy with their purchase!